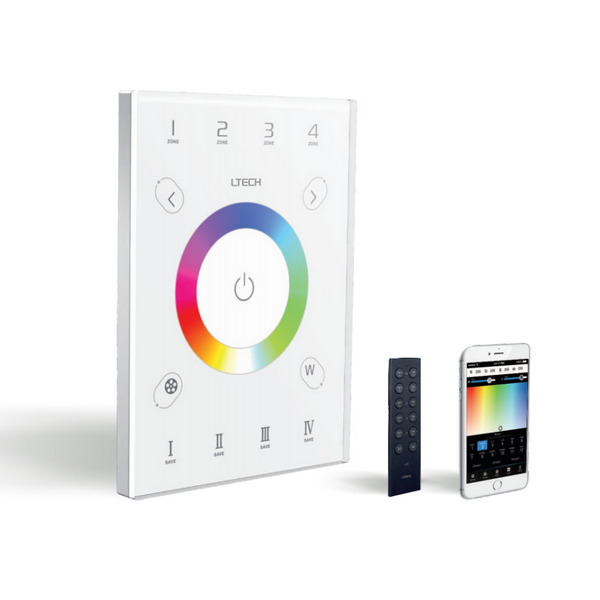 The UX8 LED Dimmer Touch panel gives you the opportunity to easily control your RGBW LED lights. 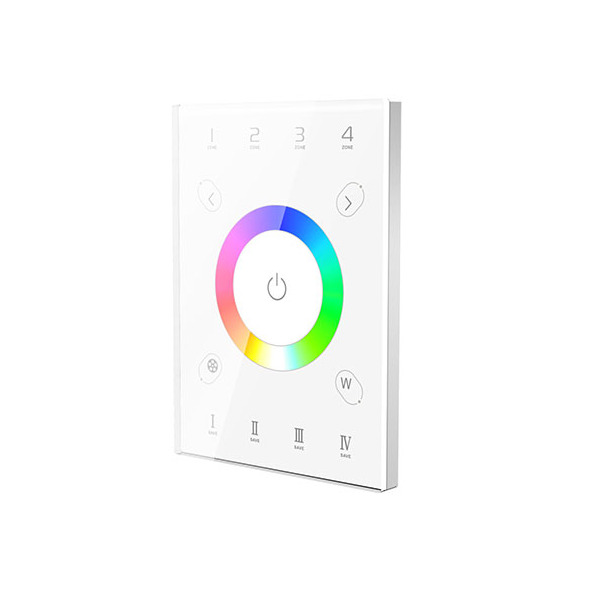 You can choose the colors by moving your finger over the color wheel in the middle. 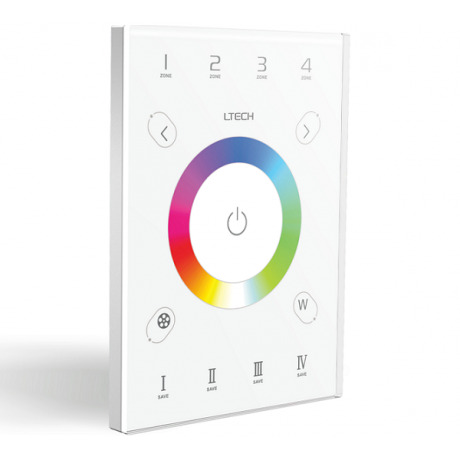 In addition, the UX8 has four zones which can be selected via the buttons 1 to 4 at the top of the panel, you can create scenes and store them with the buttons I to IV, there is a mode feature with 11 different modes, brightness control by zone, speed function and separate brightness control per color. 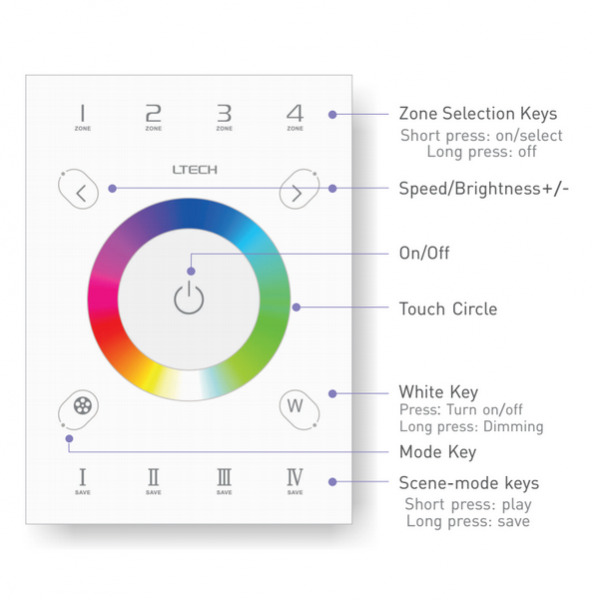 To control the white light there is the W button by pressing it briefly the white light goes on or off, and by keeping it pressed you can dim the white light. 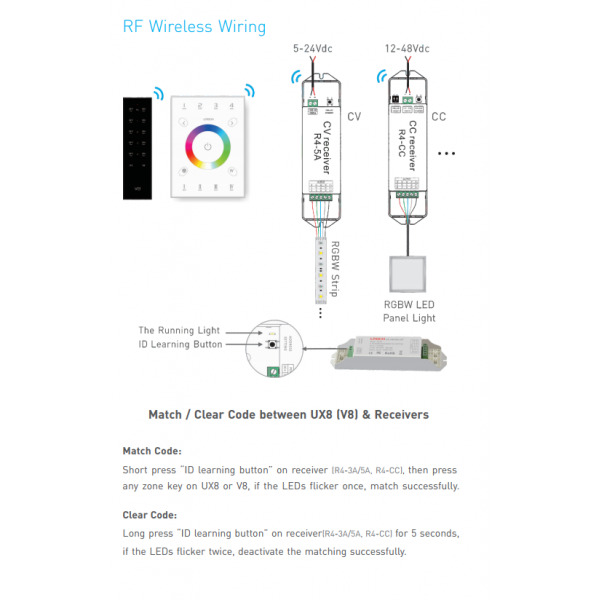 The UX8 sends a DMX or a 2.4GHz RF signal. 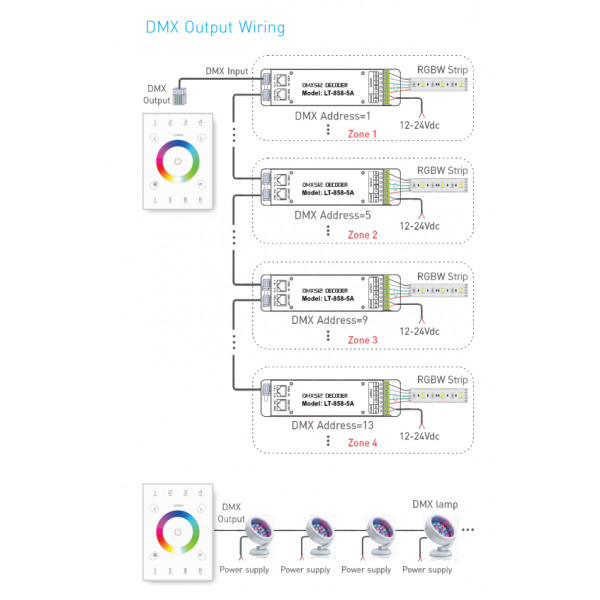 Through the DMX signal the 4 zones can be controlled by connecting DMX controllers + LED control lights. 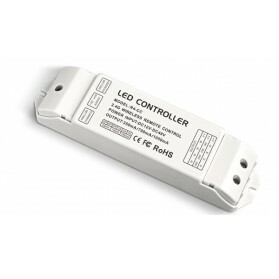 DMX controllers which can be used for this are the LT-840-6A or LT-820-5A. 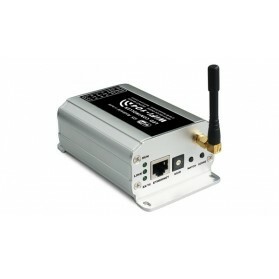 Via the 2.4GHz RF signal the four zones can be wirelessly controlled, here you connect the UX8 with R4-5A or R4-CC receiver. When using PWM Constant Voltage LED lighting you need the LED Receiver R4-5A and when using Constant Current lighting, you need the R4-CC, where you have the choice of 350mA / 700mA / 1050mA control. 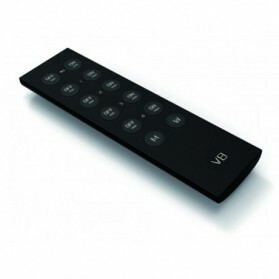 The UX8 can collaborate via RF 2.4GHz with the V8 remote, making it to operate remotely as well as manually the four zones on the panel. 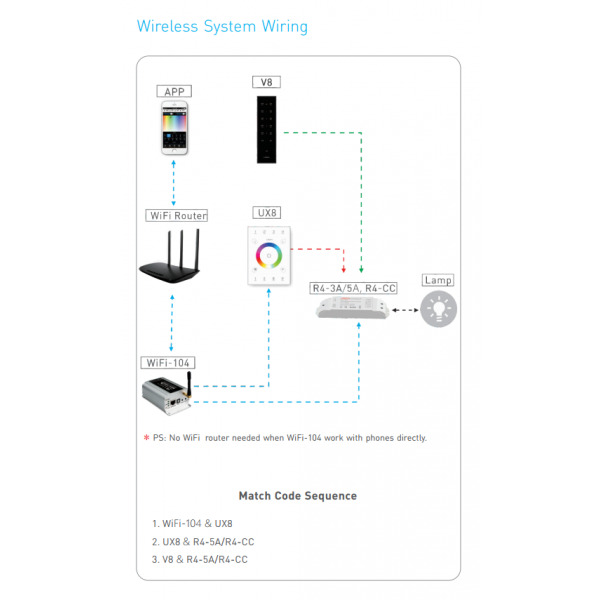 Via a WiFi signal, it is possible to connect the UX8 with the WiFi-104. 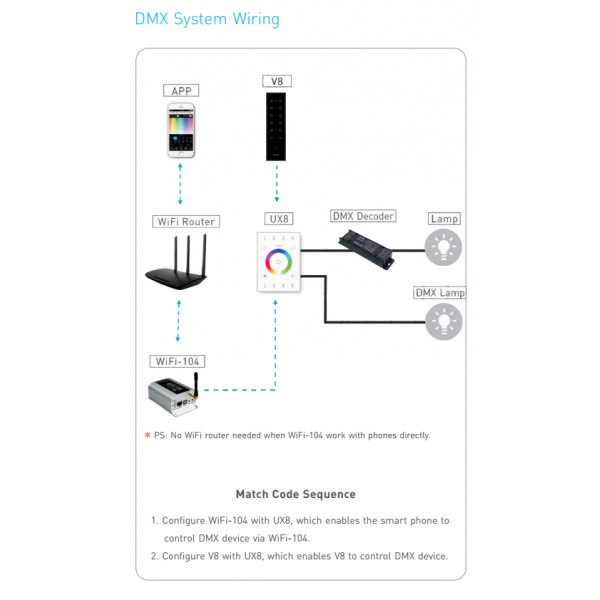 This makes it possible to operate the four areas next to the wall panel and remote control via the app on your phone or tablet. 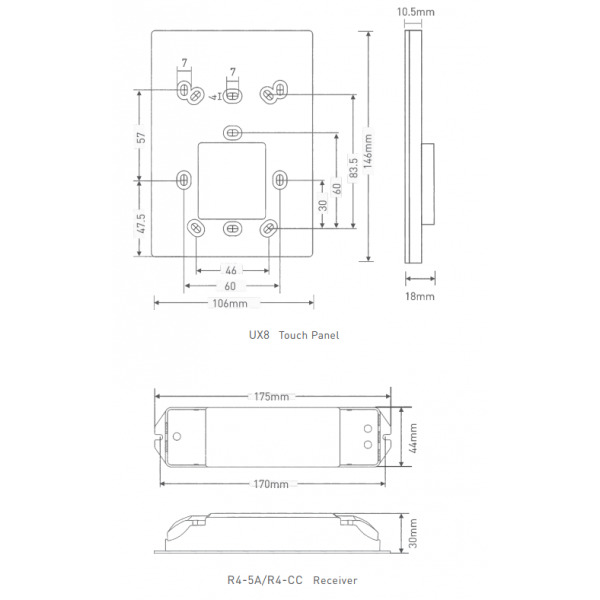 The UX8 has a universal backplate for all kind of wall boxes.